Our primary school is located in the middle of a housing estate and provides compulsory education for children between the ages 6 to 14. The football pitch, athletic ground, traffic playground and garden located on school grounds serve not only the educational needs but also relaxation. 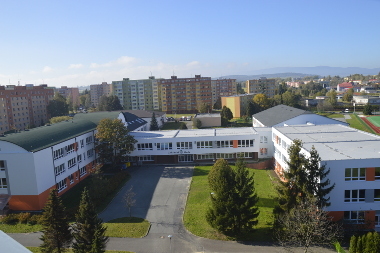 Other important parts of our school are workshops, a small and a big gym, natural science lab, physics lab, chemistry lab, geography lab, foreign language labs, music and arts and crafts labs, two IT labs, a practice kitchen used for children’ cooking, two libraries – one for the teachers and one for the children, after-school centre and last but not least the school canteen. Our aim is not only to educate the children but also create a community centre providing safe and non-threatening environment for them..
We teach them to acquire skills and knowledge, to think independently, to learn, to work and communicate with others, to practise mutual understanding and respect not only for other people but also themselves and to take responsibility for their action and work performed. The teachers of our school were trained to use modern teaching methods and they have an individual approach when working not only with the talented children but also with children with learning difficulties. They develop a three way communication: A TEACHER – A PUPIL – A PARENT not only to sort potential problems out but also to deal with everyday situation. The school provides many after-school clubs and activities (e.g. aerobics, oriental dancing, arts and crafts, touring club or IT) for the children. Our school cooperates with schools in Opole (Poland) and in Blewbury (England). The teachers and pupils visit mutualy.